The Cleveland Browns, the NFL’s feature team in the 2018 season of HBO’s Hard Knocks, contacted the Bobble Factory to help immortalize 4 of their legendary players as Life-size bobbleheads. 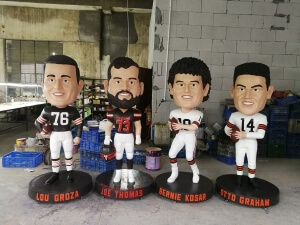 Lou Groza, Joe Thomas, Bernie Kosar and Otto Graham had the dubious honor of being the first Cleveland Players to be transformed into the larger than life bobbles. The likeness to the players are uncanny and have been well received by faithful fans of the Cleveland Browns Dawg Pound. Lucky fans have the opportunity to take their photo with some of the greats of the game. If you are interested in a custom bobblehead, then contact us at 1 (888) 504-3200.